Lurking in my loco cupboard is this rather unusual vertical boilered, tram-style locomotive. 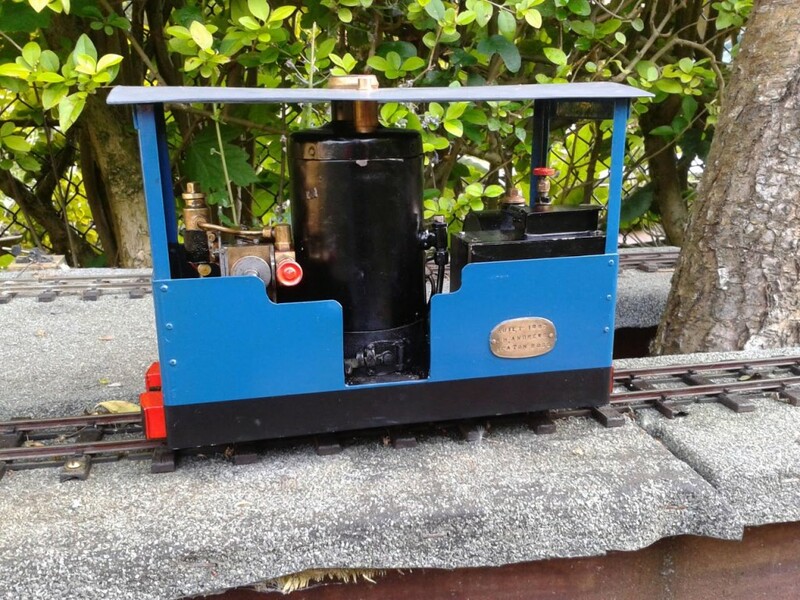 It isn’t actually part of my own fleet, but has been kindly placed on loan to my Elmdon Heath Light Railway by the owners, who do not have a garden railway of their own at present. Pausing on the down loop at Llanfair-ar-y-Ffos, the loco’s bodywork makes a bold impression. It can actually be run with or without the striking blue bodywork – without, it takes on instead something of the appearance of a de Winton loco. Only bigger – much bigger! 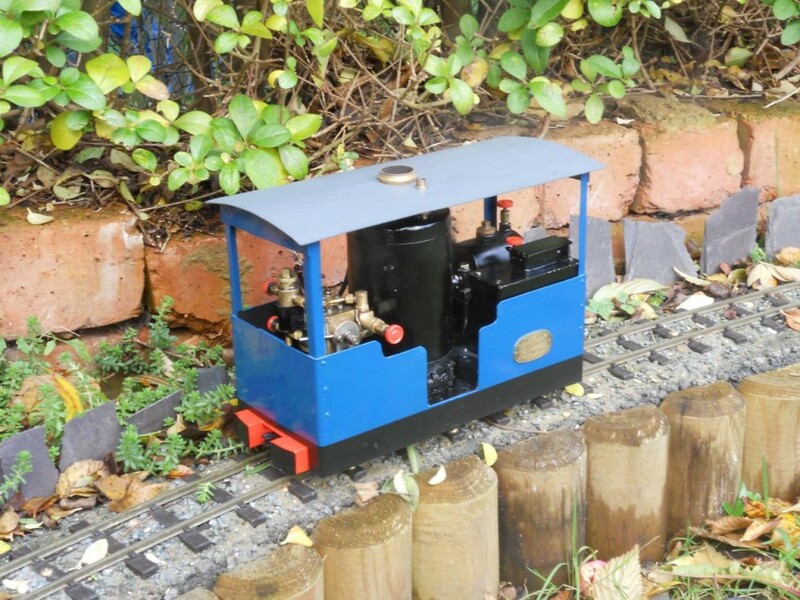 Overall, with its bodywork on, the loco is 6 1/2” high, but only 3 3/4” wide. A home-made works plate indicates that it was built in 1992 by W.H. Andrews of Seaton Ross. Without further ado, let’s take the bodywork off and have a look around the machine. What strikes you immediately is that there is little “off the shelf” about this loco. It is driven by a single, large oscillating cylinder, geared down 2:1 to the wheels. At least, it looks huge! But take a peek inside and the 7/8” outside diameter of the cylinder turns out to conceal a rather smaller bore inside: 7/16” diameter by 3/4” stroke. Without its bodywork, the loco’s appearance is transformed. Details abound. A beautiful little oil cup lubricates the crankshaft. The tiny dead-leg displacement lubricator (which seems to take about three drops of oil) has an elegant little needle valve to dispense just the right amount of oil. A condenser tank receives the exhaust steam and can direct it either up the chimney, or else a dribble of condensate down onto the track when starting up. 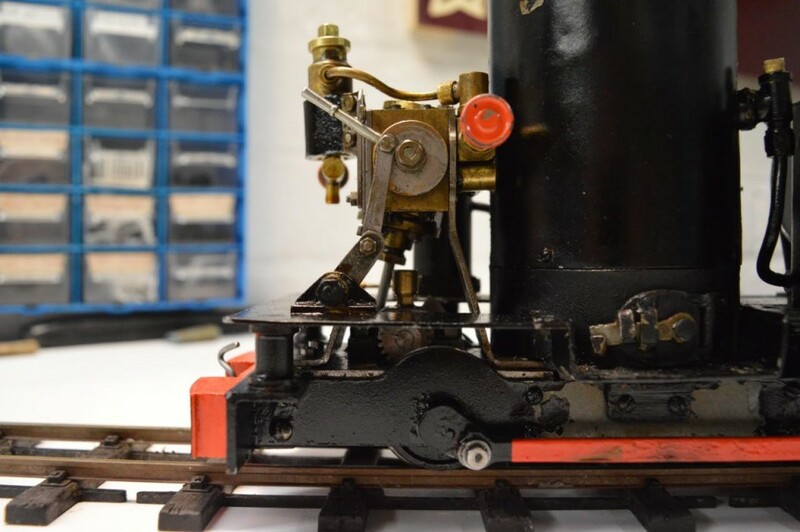 The rotary reversing valve has a beautifully turned lever attached – and a linkage down to a further shaft, the function of which seems to be to help keep the loco in gear whilst running by means of a small spring. 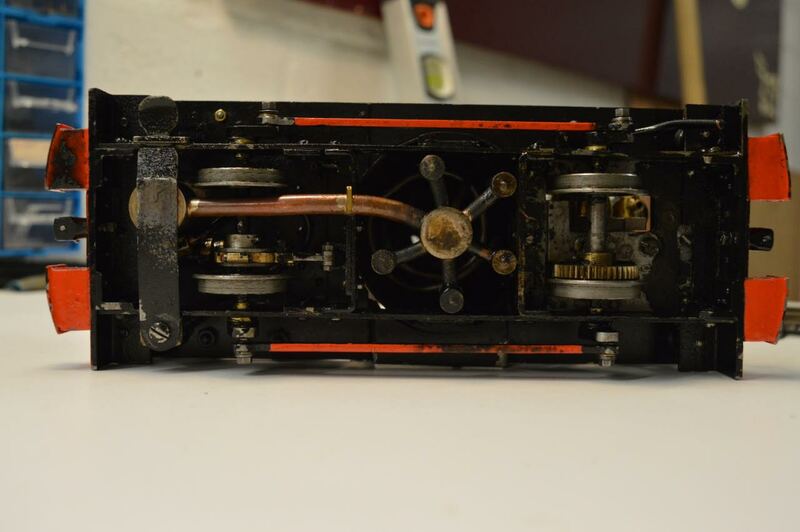 The loco’s lubricator, reversing block, regulator, single cylinder and drive gears. Vertical boiler – nothing new here, surely? But as you look around the boiler area, you gradually become aware of its complexity and novel design. Peer through the fire door (nicely detailed with hinge and latch) and you become aware of no fewer than five meths burners underneath. The catch holding the fire door closed. Is it just a single flue design, a bit like Dave Watkins’ “Idris”? Ummm, no. The top of the “smokebox” and chimney lift off to reveal a multi-tube boiler of bewildering complexity. No fewer than 15 fire tubes run between firebox and smokebox. With the “smokebox” and chimney removed, the multi-tube boiler design becomes apparent. From the steam take-off (4 o’clock in this photo) the main steam pipe descends down one of the larger flues, makes a couple of circuits of the firebox, before returning up another large flue. 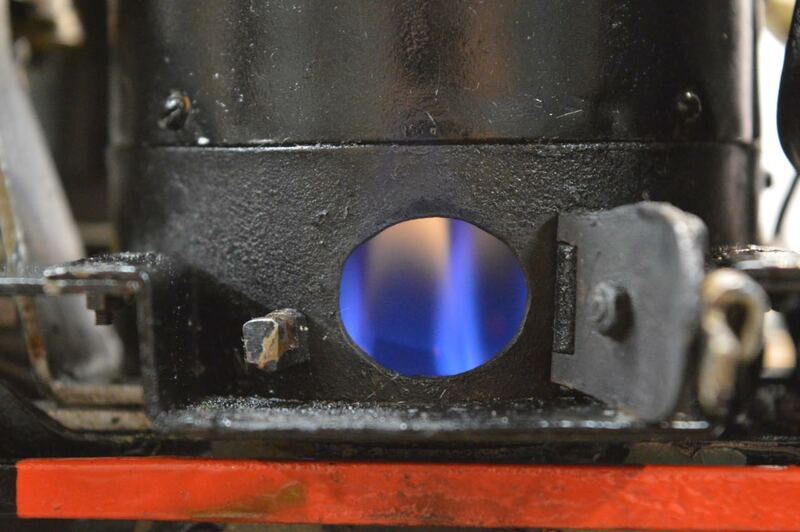 This explains why, despite the boiler’s apparent size (the boiler barrel – 2 1/2” diameter by 3” high – is actually rolled from sheet, riveted and silver soldered, rather than made from tube), the water capacity is a mere 130ml. There are three different sizes of tube: 6 at 3/8” outside diameter, 3 at 5/16” and six at 1/4”. It’s not clear whether this arrangement is original, or if more were added subsequently to improve steaming, which might explain their varying sizes. The tiny water capacity rather explains the water tank, and two pumps (hand and axle). 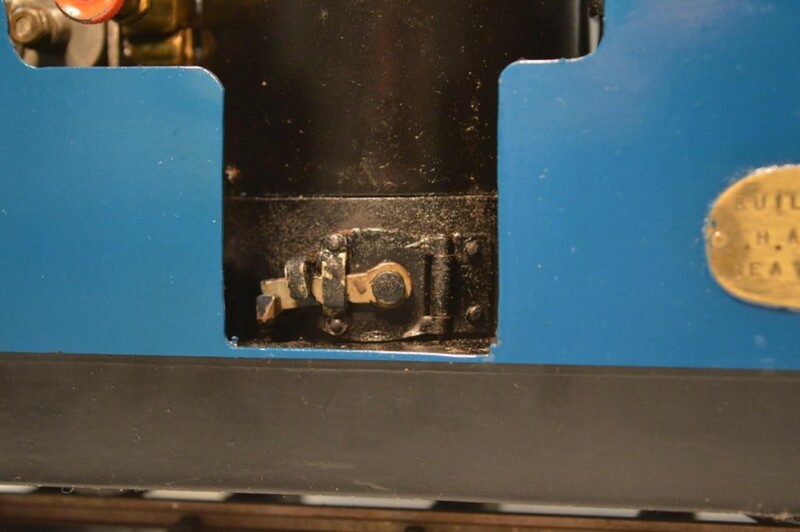 The axle pump is a devil to get at to lubricate before running, located as it is above the frames, but below the footplate and meths tank. 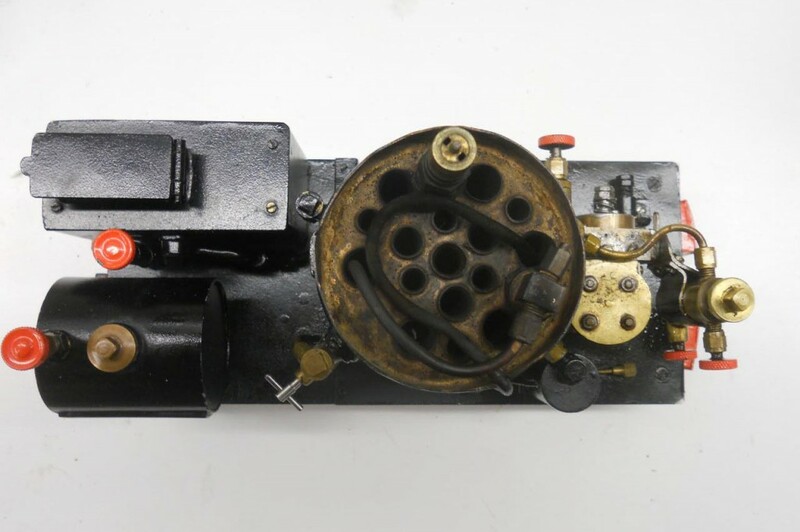 Furthermore, it’s driven from the eccentric via an intermediate lever, to make it all fit without impinging on the firebox space. A bit reminiscent of Fletcher’s Patent valve gear, as featured on “Dolgoch”, which is similarly folded back on itself. The very compact space into which the axle pump and eccentric have been squeezed. 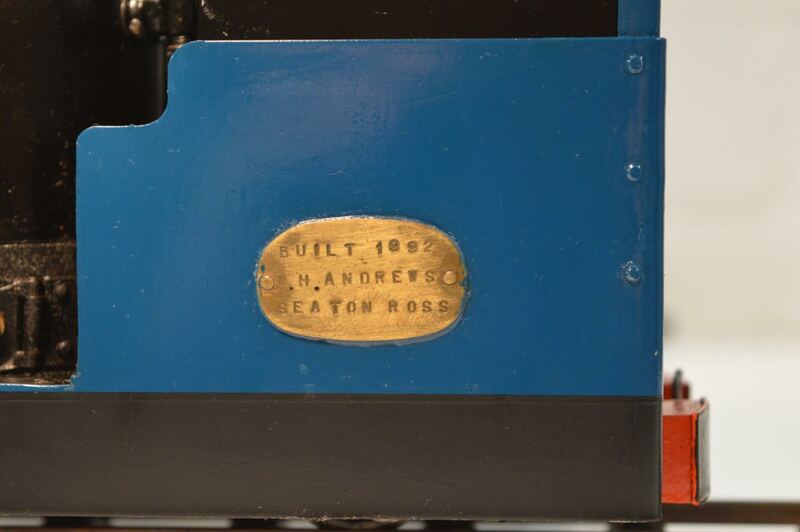 Understandably, given its volume, the boiler has a sight glass, with drain valve. A chicken feed meths tank and bypass valve complete the fittings at this end. A “below the water line” view of the tram. How is it to run? Well, if truth be told, it’s not the calmest and most relaxing loco to drive. The first thing you need to do is make sure your track is scrupulously clean. Not the railheads, but clear of leaves, twigs, grit and suchlike. The issue is that the drive gear on the leading axle is very large – almost as big in diameter as the wheels. And so it’s very prone, if you’re not careful, to picking up muck from between the rails, which then get stuck between the gear teeth and jam the mechanism up. Its other failing is a tendency, in common with some other meths-fired locos, to drip burning meths around. In particular, this can be an issue if you are trying to free it up when something has got stuck between the gears. Ask David Mees, whose railway it set on fire following a meths spill. Or Steve Hammett – different railway, but same story. Pausing at Tanyperth on the Elmdon Heath Light Railway. Other than that, it’s basically a case of making sure that tiny boiler still has water in it. 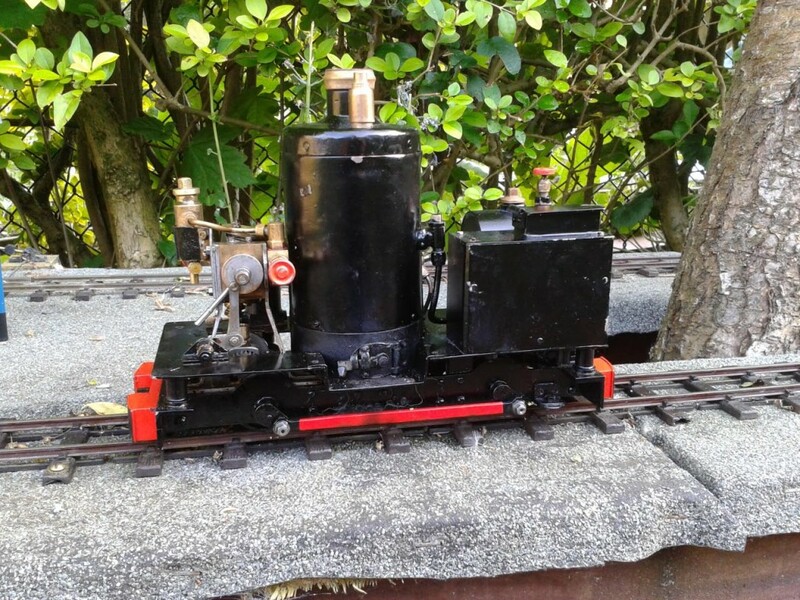 The loco came to visit without a lever for the hand pump, so I fashioned a crude but effective one from some scrap brass, shaped to make it reasonably accessible with the bodywork in place. 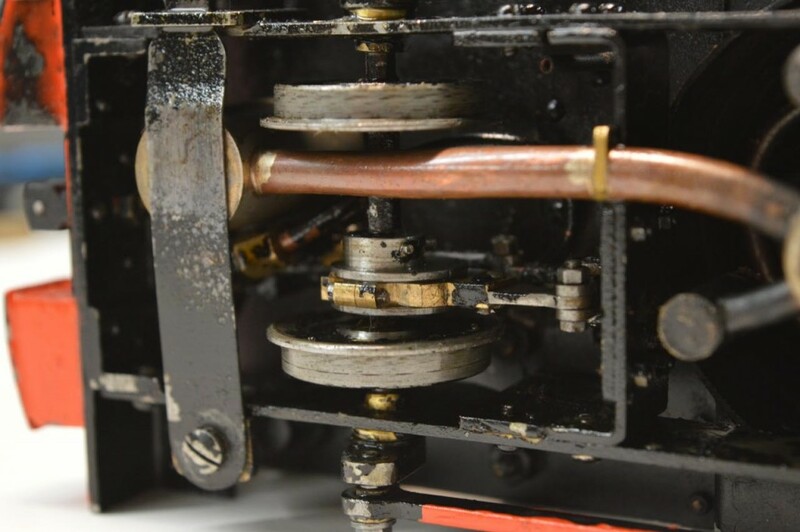 The handwheel regulator needs careful adjustment, but on a good day the loco can be regulated down to a very pleasant trundle. One of the loco’s first steamings on the EHLR, prior to completion of the main circuit. A very enjoyable trundle, during the summer of 2014.